The First and Second Barbary Wars of the early 19th century were the first wars waged by the United States outside its boundaries after the War of Independence. Directed against the Barbary States of North Africa, it was fought to end piracy against American-flagged ships in the Mediterranean. The founding of Liberia was privately sponsored by American groups, primarily the American Colonization Society, but the country enjoyed the support and unofficial cooperation of the United States government. Matthew Perry negotiated a treaty opening Japan to the West with the Convention of Kanagawa in 1854. The U.S. advanced the Open Door Policy that guaranteed equal economic access to China and support of Chinese territorial and administrative integrity. The USA has also acquired small islands in the Pacific, mostly to be used as coaling stations. From 1846 to 1848, Mexico and the United States warred over Texas, California and what today is the American Southwest but was then part of Mexico. During this war, US. troops invaded and occupied parts of Mexico, including Veracruz and Mexico City. The early decades of the 20th century saw a number of interventions in Latin America by the U.S. government often justified under the Roosevelt Corollary to the Monroe Doctrine. President William Howard Taft viewed "Dollar Diplomacy" as a way for American corporations to benefit while assisting in the national security goal of preventing European powers from filling any possible financial or power vacuum. 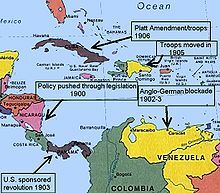 1901: The Platt Amendment amended a treaty between the US and Cuba after the Spanish–American War virtually made Cuba a U.S. protectorate. The amendment outlined conditions for the U.S. to intervene in Cuban affairs and permitted the United States to lease or buy lands for the purpose of the establishing naval bases, including Guantánamo Bay. 1904: When European governments began to use force to pressure Latin American countries to repay their debts, Theodore Roosevelt announced his "Corollary" to the Monroe Doctrine, stating that the United States would intervene in the Western Hemisphere should Latin American governments prove incapable or unstable. 1906 to 1909: U.S. governed Cuba under Governor Charles Magoon. 1909: U.S.-backed rebels in Nicaragua depose President José Santos Zelaya. 1912 to 1933 United States occupation of Nicaragua: Marines occupied main cities. Their purpose was to provide stabilization to the government. There was a period of a few months between 1925 and 1926 when the Marines left but were back for the same reason. 1914 to 1917: Mexico conflict and Pancho Villa Expedition, U.S. troops entering northern portion of Mexico. The U.S. intervened in Europe during World War I. US troops intervened in the Russian Civil War against the Red Army with the Polar Bear Expedition. During the Second World War, the United States sent troops to fight in both Europe and the Pacific. It was a key participant in many battles, including the Battle of Midway, the Normandy landings, and the Battle of the Bulge. After the war, American troops occupied both Germany and Japan. The United States also gave economic support large number of countries and movements who were opposed to the Axis powers. This included the Lend-Lease program, which "lent" a wide array of resources and weapons to many countries, especially Great Britain and the USSR, ostensibly to be repaid after the war. In practice, the United States frequently either did not push for repayment, or "sold" the goods for a nominal price, such as 10% of their value. Significant aid was also sent to France and the Republic of China, and Resistance movements in countries occupied by the Axis. The US helped form the North Atlantic Treaty Organization in 1949 to resist communist expansion. The United States supported resistance movements and dissidents in the communist regimes of Central and Eastern Europe and the Soviet Union during the Cold War. One example is the counterespionage operations following the discovery of the Farewell Dossier which some argue contributed to the fall of the Soviet regime. After Joseph Stalin instituted the Berlin Blockade, the United States, Britain, France, Canada, Australia, New Zealand and several other countries began the massive "Berlin airlift", supplying West Berlin with up to 4,700 tons of daily necessities. US Air Force pilot Gail Halvorsen created "Operation Vittles", which supplied candy to German children. In May 1949, Stalin backed down and lifted the blockade. The US spent billions rebuilding Europe and aiding global development through programs such as the Marshall Plan. From 1950 to 1953, US and UN forces fought communist Chinese and North Korean troops in the Korean War, which saw South Korea successfully defended from invasion. US troops remain in South Korea to deter further conflict, as the war has not officially ended. President Harry Truman was unable to roll back the North Korean government due to Chinese intervention, but the goal of containment was achieved. During the Cold War, the US frequently used the CIA for covert operations against governments considered unfriendly to US interests. In 1949 under US President Harry Truman, a coup overthrew an elected parliamentary government in Syria, which had delayed approving an oil pipeline requested by US international business interests in that region. The exact role of the CIA in that coup is controversial, but it is clear that US governmental officials, including at least one CIA officer, communicated with the coup organizer, Za'im, before the March 30 coup and were at least aware that it was being planned—and six weeks later on May 16, Za'im approved the pipeline. In 1953, under US President Dwight Eisenhower, the CIA helped Shah Mohammad Reza Pahlavi of Iran remove the democratically elected Prime Minister, Mohammed Mossadegh (although supporters of US policy claimed that Mossadegh had ended democracy through a rigged referendum). 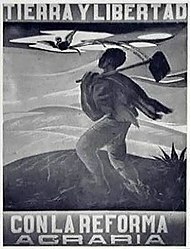 In 1954, the CIA launched Operation PBSUCCESS, which deposed the democratically elected Guatemalan President Jacobo Árbenz and ended the Guatemalan Revolution. The coup installed the military dictatorship of Carlos Castillo Armas, the first in a series of U.S.-backed dictators who ruled Guatemala. Guatemala subsequently plunged into a civil war that cost scores of thousands of lives and ended all democratic expression for decades. The CIA armed an indigenous insurgency in order to oppose the invasion of Tibet by Chinese forces and the subsequent control of Tibet by China, and sponsored a failed revolt against Indonesian President Sukarno in 1958. As part of the Eisenhower Doctrine, the US also sent troops to Lebanon in Operation Blue Bat. Covert operations continued under President John F. Kennedy and his successors. In 1961, the CIA attempted to depose Cuban president Fidel Castro through the Bay of Pigs Invasion. The CIA (with Cuban exiles and South African mercenaries) fought Maoist "Simbas" and Afro-Cuban rebels (led by Che Guevara) during the Congo Crisis. The CIA also considered assassinating Congolese leader Patrice Lumumba with poisoned toothpaste (although this plan was aborted). In 1961, the CIA supported the overthrow of Rafael Trujillo, dictator of the Dominican Republic. After a period of instability, US troops invaded the Dominican Republic in Operation Power Pack, initially to evacuate US citizens on the island and ultimately to broker a cease-fire in the civil war. President John F. Kennedy meeting with Cheddi Jagan in October 1961. The trip was a political disaster for Jagan, who failed to sooth the suspicions of Kennedy and Congress by equivocating on Cold War issues. At the end of the Eisenhower administration, a campaign was initiated to deny Cheddi Jagan power in an independent Guyana. This campaign was intensified and became something of an obsession of John F. Kennedy, because he feared a "second Cuba". By the time Kennedy took office, the United Kingdom was ready to decolonize British Guiana and did not fear Jagan's political leanings, yet chose to cooperate in the plot for the sake of good relations with the United States. The CIA cooperated with AFL-CIO, most notably in organizing an 80-day general strike in 1963, backing it up with a strike fund estimated to be over $1 million. The Kennedy Administration put pressure on Harold Macmillan's government to help in its effort, ultimately attaining a promise on July 18, 1963, that Macmillan's government would unseat Jagan. This was achieved through a plan developed by Duncan Sandys whereby Sandy, after feigning impartiality in a Guyanese dispute, would decide in favor of Forbes Burnham and Peter D'Aguiar, calling for new elections based on proportional representation before independence would be considered, under which Jagan's opposition would have better chances to win. The plan succeeded, and the Burnham-D'Aguiar coalition took power soon after winning the election on December 7, 1964. The Johnson administration later helped Burnham fix the fraudulent election of 1968—the first election after decolonization in 1966. To guarantee Burnham's victory, Johnson also approved a well-timed Food for Peace loan, announced some weeks before the election so as to influence the election but not to appear to be doing so. US–Guyanan relations cooled in the Nixon administration. Henry Kissinger, in his memoirs, dismissed Guyana as being "invariably on the side of radicals in Third World forums." From 1965 to 1973, US troops fought at the request of the governments of South Vietnam, Laos, and Cambodia during the Vietnam War against the military of North Vietnam and against Viet Cong, Pathet Lao, and Khmer Rouge insurgents. President Lyndon Johnson escalated US involvement following the Gulf of Tonkin Resolution. North Vietnam invaded Laos in 1959, and used 30,000 men to build invasion routes through Laos and Cambodia. North Vietnam sent 10,000 troops to attack the south in 1964, and this figure increased to 100,000 in 1965. By early 1965, 7,559 South Vietnamese hamlets had been destroyed by the Viet Cong. The CIA organized Hmong tribes to fight against the Pathet Lao, and used Air America to "drop 46 million pounds of foodstuffs....transport tens of thousands of troops, conduct a highly successful photoreconnaissance program, and engage in numerous clandestine missions using night-vision glasses and state-of-the-art electronic equipment." After sponsoring a coup against Ngô Đình Diệm, the CIA was asked "to coax a genuine South Vietnamese government into being" by managing development and running the Phoenix Program that killed thousands of insurgents. North Vietnamese forces attempted to overrun Cambodia in 1970, to which the US and South Vietnam responded with a limited incursion. The US bombing of Cambodia, called Operation Menu, proved controversial. Although David Chandler argued that the bombing "had the effect the Americans wanted--it broke the communist encirclement of Phnom Penh," others have claimed it boosted recruitment for the Khmer Rouge. North Vietnam violated the Paris Peace Accords after the US withdrew, and all of Indochina had fallen to communist governments by late 1975. In 1975 it was revealed by the Church Committee that the United States had covertly intervened in Chile from as early as 1962, and that from 1963 to 1973, covert involvement was "extensive and continuous". In 1970, at the request of President Richard Nixon, the CIA planned a "constitutional coup" to prevent the election of Marxist leader Salvador Allende in Chile, while secretly encouraging Chilean generals to act against him. The CIA changed its approach after the murder of Chilean general René Schneider, offering aid to democratic protestors and other Chilean dissidents. Allende was accused of supporting armed groups, torturing detainees, conducting illegal arrests, and muzzling the press; historian Mark Falcoff therefore credits the CIA with preserving democratic opposition to Allende and preventing the "consolidation" of his supposed "totalitarian project". However, Peter Kornbluh asserts that the CIA destabilized Chile and helped create the conditions for the 1973 Chilean coup d'état, which led to years of dictatorship under Augusto Pinochet. In 1973, Nixon authorized Operation Nickel Grass, an overt strategic airlift to deliver weapons and supplies to Israel during the Yom Kippur War, after the Soviet Union began sending arms to Syria and Egypt. From 1972–5, the CIA armed Kurdish rebels fighting the Ba'athist government of Iraq. Months after the Saur Revolution brought a communist regime to power in Afghanistan, the US began offering limited financial aid to Afghan dissidents through Pakistan's Inter-Services Intelligence, although the Carter administration rejected Pakistani requests to provide arms. After the Iranian Revolution, the United States sought rapprochement with the Afghan government—a prospect that the USSR found unacceptable due to the weakening Soviet leverage over the regime. The Soviets invaded Afghanistan on December 24, 1979 to depose Hafizullah Amin, and subsequently installed a puppet regime. Disgusted by the collapse of detente, President Jimmy Carter began covertly arming Afghan mujahideen in a program called Operation Cyclone. This program was greatly expanded under President Ronald Reagan as part of the Reagan Doctrine. As part of this doctrine, the CIA also supported the UNITA movement in Angola, the Solidarity movement in Poland, the Contra revolt in Nicaragua, and the Khmer People's National Liberation Front in Cambodia. US and UN forces later supervised free elections in Cambodia. Under Reagan, the US sent troops to Lebanon during the Lebanese Civil War as part of a peace-keeping mission. The US withdrew after 241 servicemen were killed in the Beirut barracks bombing. In Operation Earnest Will, US warships escorted reflagged Kuwaiti oil tankers to protect them from Iranian attacks during the Iran–Iraq War. The United States Navy launched Operation Praying Mantis in retaliation for the Iranian mining of the Persian Gulf during the war and the subsequent damage to an American warship. The attack helped pressure Iran to agree to a ceasefire with Iraq later that summer, ending the eight-year war. Under Carter and Reagan, the CIA repeatedly intervened to prevent right-wing coups in El Salvador and the US frequently threatened aid suspensions to curtail government atrocities in the Salvadoran Civil War. As a result, the death squads made plans to kill the US Ambassador. In 1983, after an internal power struggle ended with the deposition and murder of revolutionary Prime Minister Maurice Bishop, the US invaded Grenada in Operation Urgent Fury and held free elections. In 1986, the US bombed Libya in response to Libyan involvement in international terrorism. President George H. W. Bush ordered the invasion of Panama (Operation Just Cause) in 1989 and deposed dictator Manuel Noriega. The US intervened in Kuwait after a series of failed diplomatic negotiations, led a coalition to remove the Iraqi invader forces, in what became known as the Gulf War. On 26 February 1991, the coalition succeeded in driving out the Iraqi forces. As they retreated, Iraqi forces carried out a scorched earth policy by setting oil wells on fire. During the Iraqi occupation, about 1,000 Kuwaiti civilians were killed and more than 300,000 residents fled the country. In the 1990s, the US intervened in Somalia as part of UNOSOM I, a United Nations humanitarian relief operation. The mission saved hundreds of thousands of lives. During the Battle of Mogadishu, two U.S. helicopters were shot down by rocket-propelled grenade attacks to their tail rotors, trapping soldiers behind enemy lines. This resulted in an urban battle that killed 18 American soldiers, wounded 73 others, and one was taken prisoner. There were many more Somali casualties. Some of the American bodies were dragged through the streets – a spectacle broadcast on television news programs. In response, U.S. forces were withdrawn from Somalia and later conflicts were approached with fewer soldiers on the ground. Under President Bill Clinton, the US participated in Operation Uphold Democracy, a UN mission to reinstate the elected president of Haiti, Jean-Bertrand Aristide, after a military coup. In 1995, Clinton ordered US and NATO aircraft to attack Bosnian Serb targets to halt attacks on UN safe zones and to pressure them into a peace accord. Clinton deployed U.S. peacekeepers to Bosnia in late 1995, to uphold the subsequent Dayton Agreement. In response to the 1998 al-Qaeda bombings of U.S. embassies in East Africa that killed a dozen Americans and hundreds of Africans, Clinton ordered cruise missile strikes on targets in Afghanistan and Sudan. First was the Sudanese Al-Shifa pharmaceutical factory, suspected of assisting Osama Bin Laden in making chemical weapons. The second was Bin Laden's terrorist training camps in Afghanistan. Also, To stop the ethnic cleansing and genocide of Albanians by nationalist Serbians in the former Federal Republic of Yugoslavia's province of Kosovo, Clinton authorized the use of American troops in a NATO bombing campaign against Yugoslavia in 1999, named Operation Allied Force. The CIA was involved in the failed 1996 coup attempt against Saddam Hussein. After the September 11, 2001 attacks, under President George W. Bush, the US and NATO intervened to depose the Taliban government in the Afghan war. In 2003, the US and a multi-national coalition invaded Iraq to depose Saddam. Afghanistan remains under military occupation, while the Iraq War officially ended on December 15, 2011. The US has launched drone attacks in Pakistan, Yemen and Somalia against suspected terrorist targets. The US has used large amounts of aid and counter-insurgency training to enhance stability and reduce violence in war-ravaged Colombia, in what has been called "the most successful nation-building exercise by the United States in this century". The US intervened in the 2011 Libyan civil war by providing air power. There was also speculation in The Washington Post that President Barack Obama issued a covert action finding in March 2011 that authorized the CIA to carry out a clandestine effort to provide arms and support to the Libyan opposition. Muammar Gaddafi was ultimately overthrown and killed. U.S. Navy has actively participated in the Saudi Arabian-led naval blockade of Yemen. Under the aegis of operation Timber Sycamore and other clandestine activities, CIA operatives and U.S. special operations troops trained and armed nearly 10,000 Syrian rebel fighters since 2012 at a cost of $1 billion a year, phased out in 2017. In August 2014, the US began airstrikes against ISIS in Iraq in response to recent gains by the terrorist group that threatened American assets and Iraqi government forces. This was followed by more airstrikes on the 23rd of September in Syria, where the US-led coalition group targeted ISIS positions throughout the war-ravaged nation. Airstrikes involved fighters, bombers, and launching Tomahawk cruise missiles. In March 2015, President Barack Obama declared that he had authorized U.S. forces to provide logistical and intelligence support to the Saudis in their military intervention in Yemen, establishing a "Joint Planning Cell" with Saudi Arabia. A 2016 study published in the Journal of Conflict Resolution (published by the University of Maryland) analyzing US military interventions in the period 1981–2005 found that the US "is likely to engage in military campaigns for humanitarian reasons that focus on human rights protection rather than for its own security interests such as democracy promotion or terrorism reduction." A 2016 study by Carnegie Mellon University professor Dov Levin found that the United States intervened in 81 foreign elections between 1946 and 2000, with the majority of those being through covert, rather than overt, actions. ^ John Pike. "Barbary Wars". globalsecurity.org. ^ "Open Door policy". Encyclopædia Britannica. ^ "Home - Theodore Roosevelt Association". theodoreroosevelt.org. ^ "Our Documents - Platt Amendment (1903)". ourdocuments.gov. ^ "Panama declares independence". HISTORY.com. ^ "Our Documents - Theodore Roosevelt's Corollary to the Monroe Doctrine (1905)". ourdocuments.gov. ^ Lockmiller, David A. (1 January 1937). "Agriculture in Cuba during the Second United States Intervention, 1906-1909". Agricultural History. 11 (3): 181–188. JSTOR 3739793. ^ "Nicaragua timeline". BBC News. 9 November 2011. ^ "United States Interventions in Mexico, 1914-1917". Archived from the original on March 27, 2004. ^ "Presidential Key Events". millercenter.org. ^ "CIA slipped bugs to Soviets". Washington Post. NBC. Retrieved 2008-11-21. ^ "The Farewell Dossier". Central Intelligence Agency. Retrieved 2008-11-21. ^ Briggs, Billy (2 February 2007). "Billy Briggs on the atrocities of Guatemala's civil war". The Guardian. London. ^ "Timeline: Guatemala". BBC News. 9 November 2011. ^ Conboy, Kenneth and Morrison, James, The CIA's Secret War in Tibet (2002). ^ Road night, Andrew (2002). United States Policy towards Indonesia in the Truman and Eisenhower Years. New York: Palgrave Macmillan. ISBN 0-333-79315-3. ^ "ASSASSINATION PLANNING AND THE PLOTS A. CONGO" (PDF). ^ Gott 2004 p. 219. ^ Rabe, Stephen G. (1999). The Most Dangerous Area in the World: John F. Kennedy Confronts Communist Revolution in Latin America. Chapel Hill: University of North Carolina press. pp. 86–88. ISBN 080784764X. ^ Rabe, Stephen G. (2005). U.S. intervention in British Guiana: a Cold War story. Chapel Hill: University of North Carolina Press. pp. 72–73. ISBN 0-8078-5639-8. ^ Rabe, Stephen G. (2005). U.S. intervention in British Guiana: a Cold War story. Chapel Hill: University of North Carolina Press. pp. 8, 123. ISBN 0-8078-5639-8. ^ Rabe, Stephen G. (2005). U.S. intervention in British Guiana: a Cold War story. Chapel Hill: University of North Carolina Press. p. 177. ISBN 0-8078-5639-8. ^ Rabe, Stephen G. (2005). U.S. intervention in British Guiana: a Cold War story. Chapel Hill: University of North Carolina Press. pp. 110–112. ISBN 0-8078-5639-8. ^ Rabe, Stephen G. (2005). U.S. intervention in British Guiana: a Cold War story. Chapel Hill: University of North Carolina Press. p. 118. ISBN 0-8078-5639-8. ^ Rabe, Stephen G. (2005). U.S. intervention in British Guiana: a Cold War story. Chapel Hill: University of North Carolina Press. pp. 106, 119–122. ISBN 0-8078-5639-8. ^ Rabe, Stephen G. (2005). U.S. intervention in British Guiana: a Cold War story. Chapel Hill: University of North Carolina Press. p. 137. ISBN 0-8078-5639-8. ^ a b Rabe, Stephen G. (2005). U.S. intervention in British Guiana: a Cold War story. Chapel Hill: University of North Carolina Press. pp. 157–160. ISBN 0-8078-5639-8. ^ Rabe, Stephen G. (2005). U.S. intervention in British Guiana: a Cold War story. Chapel Hill: University of North Carolina Press. pp. 168–169. ISBN 0-8078-5639-8. ^ The Economist, February 26, 1983. ^ Washington Post, April 23, 1985. ^ Readers Digest, "The Blood-Red Hands of Ho Chi Minh", November 1968. ^ Powers, The Man who kept the Secrets (1979) at 198-201, 203, 204-206, 209-212. ^ Dmitry Mosyakov, "The Khmer Rouge and the Vietnamese Communists: A History of Their Relations as Told in the Soviet Archives," in Susan E. Cook, ed., Genocide in Cambodia and Rwanda (Yale Genocide Studies Program Monograph Series No. 1, 2004), p54ff. "In April–May 1970, many North Vietnamese forces entered Cambodia in response to the call for help addressed to Vietnam not by Pol Pot, but by his deputy Nuon Chea. Nguyen Co Thach recalls: "Nuon Chea has asked for help and we have liberated five provinces of Cambodia in ten days." ^ Shawcross, William (1979). Sideshow: Kissinger, Nixon and the Destruction of Cambodia. University of Michigan. ISBN 0-671-23070-0. ^ Church Committee (1975). "Covert Action in Chile: 1963-1973". pp. 14–15, 1. ^ a b c Falcoff, Mark, Kissinger and Chile, Commentary, 2003. ^ Alleged Assassination Plots Involving Foreign Leaders (1975), Church Committee, pages 246–247 and 250–254. ^ Kornbluh, Peter (2003). The Pinochet File: A Declassified Dossier on Atrocity and Accountability. New York: The New Press. ISBN 1-56584-936-1. ^ Robert M. Gates (2007). From the Shadows: The Ultimate Insider's Story of Five Presidents and How They Won the Cold War. Simon Schuster. p. 146. Retrieved July 28, 2011. ^ Rubin, Michael, "Who is Responsible for the Taliban? ", Middle East Review of International Affairs, Vol. 6, No. 1 (March 2002). ^ John Pike. "UNITA Uniao Nacional para a Independecia Total de Angola". globalsecurity.org. ^ MacEachin, Douglas J. "US Intelligence and the Polish Crisis 1980-1981." CIA. June 28, 2008. ^ Far Eastern Economic Review, December 22, 1988, details the extensive fighting between the U.S.-backed forces and the Khmer Rouge. ^ Peniston, Bradley (2006). No Higher Honor: Saving the USS Samuel B. Roberts in the Persian Gulf. Annapolis: Naval Institute Press. ISBN 1-59114-661-5. , p. 217. ^ "Noriega extradited to France". CNN. 26 April 2010. ^ "UNITED NATIONS OPERATION IN SOMALIA I - (UNOSOM I)". United Nations. ^ "The United States Army in Somalia, 1992-1994". U.S. Army. ^ Pike, John. "BGM-109 Tomahawk – Smart Weapons". Globalsecurity.org. Retrieved August 17, 2011. ^ Cohen, William (April 7, 1999). "Secretary Cohen's Press Conference at NATO Headquarters Archived May 29, 2011, at the Wayback Machine". Retrieved August 30, 2011. ^ Clinton, Bill (June 25, 1999). "Press Conference by the President Archived 2007-06-29 at WebCite". Retrieved August 30, 2011. ^ Currier, Cora (5 February 2013). "Everything We Know So Far About Drone Strikes". ProPublica. Retrieved 9 March 2017. ^ "The Drone Papers". The Intercept. Retrieved 9 March 2017. ^ Jaffe, Greg (March 30, 2011). "In Libya, CIA is gathering intelligence on rebels". The Washington Post. Retrieved May 19, 2011. ^ "U.S. carrier moving off coast of Yemen to block Iranian arms shipments". USA Today. 20 April 2015. ^ "U.S. has secretly provided arms training to Syria rebels from 2012". Los Angeles Times. 21 June 2013. ^ Jaffe, Greg; Entous, Adam (19 July 2017). "Trump ends covert CIA program to arm anti-Assad rebels in Syria, a move sought by Moscow". The Washington Post. Retrieved 20 July 2017. ^ Ignatius, David (2017-07-20). "What the demise of the CIA's anti-Assad program means". The Washington Post. Retrieved 2017-07-23. ^ Julian E. Barnes and Dion Nissenbaum (7 August 2014). "U.S., Arab Allies Launch Airstrikes Against Islamic State Targets in Syria". Wall Street Journal. Retrieved 25 September 2014. ^ Choi, Seung-Whan; James, Patrick (2016-08-01). "Why Does the United States Intervene Abroad? Democracy, Human Rights Violations, and Terrorism". Journal of Conflict Resolution. 60 (5): 899–926. doi:10.1177/0022002714560350. ISSN 0022-0027. ^ Levin, Dov H. (June 2016). "When the Great Power Gets a Vote: The Effects of Great Power Electoral Interventions on Election Results". International Studies Quarterly. 60 (2): 189–202. ^ The U.S. is no stranger to interfering in the elections of other countries, Los Angeles Times, (December 21, 2016).